de Vere's believes that pubs are not only a place to enjoy a perfectly poured pint of Guinness—they’re also a hub for soccer culture. That’s why we pride ourselves on being the region’s premier place to watch soccer. Here, soccer fans can enjoy up to five matches at once (two with sound) on our nine HD flat screen TVs—all while surrounded with the area’s biggest supporters. Every soccer club has die-hard fans cheering them on from around the world. Our pub is committed to giving those fans a home base to congregate and watch live matches throughout the season. That’s why we partner with local supporters clubs to help them find fellow fans and give them a lively atmosphere that helps supports the soccer culture they love. We often open (very!) early to air international matches live. As our supporters following becomes more and more established, we’ll be able to open early for more and more matches. If you want to know when our Sacramento pub is opening for early matches please follow us on Twitter for announcements! Being a member of our Whiskey Society gives you access to discounts, specials, and events! Whiskey Wednesday: Every Wednesday from 7-close all whiskey's are 50% off! Big Bottle Night: A few times a year we will purchase a rare or exclusive whiskey to offer to our whiskey society email list at cost. Space will be limited to these events, so pay attention to your emails for invites to sign up. We will showcase the bottle allowing for one shot per registered guest to enjoy at the actual wholesale cost. This will allow our members access to a bottle that may otherwise be out of their normal day to day reach. Whiskey Tastings: Every quarter we will hold a whiskey tasting at each pub showcasing a specific distillery with a distillery representative to guide you through the tasting. The tasting formats vary, but usually include a welcome cocktail, a few different marks from the distillery line up paired with light appetizers for you to enjoy while learning about each whiskey. Communication: As a member of the Whiskey Society you will receive emails detailing whiskey events and emails that give you updates on our promotions and new whiskeys that we acquire. Please make sure to accept our emails and allow them in your primary inbox so that you do not miss out on any event invites or whiskey updates. **Please use your daily email & not a secondary email or you will miss out on events and offers. We will send out emails to you and you must sign up to attend as space is limited to ensure an intimate whiskey experience. Please make sure you are receiving our emails so you can attend our next event. Sign up with your email address to receive updates on whiskey tastings, new products & shenanigans! If you're looking for a pub quiz on Monday night in Sacramento or Davis, head down to de Vere's Irish Pub. Ranked as one of the top 10 pub quizzes in the Sacramento area, our weekly competition lets you and your smartest friends compete for points, pints, prizes and bragging rights! Both our Davis and Sacramento pub quizzes start at 7pm sharp, so it's best to arrive early to make sure you have a table. Want to know about holiday hours or changes to our pub quiz schedule? We are constantly recruiting energetic hospitality focused people to join our team. de Vere’s Irish pub is looking for the right people in all positions. No experience required. Someone that wants an opportunity to grow. Who works well on a team. We sell tons of burgers. We are always looking to meet amazing people please apply today! 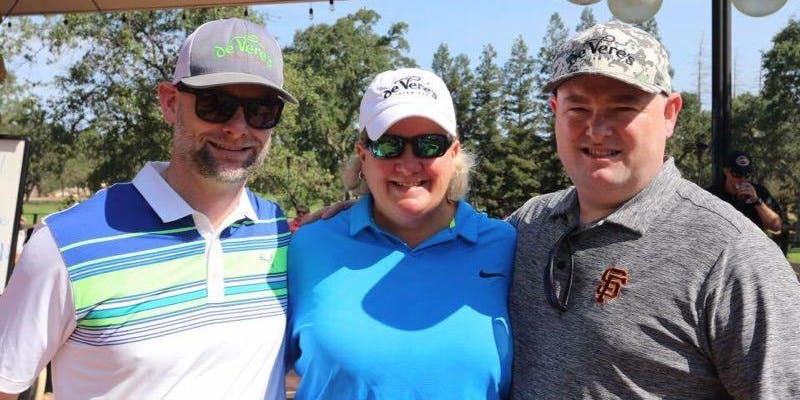 Please join us for the fourth annual de Vere’s Classic Puttin’ for Presents Golf Tournament on Friday, July 13th, 2018 at Rancho Murieta Country Club outside of Sacramento. We are proud to partner with The Kylee Lillich Charitable Giving Tree (www.kyleesgivingtree.org), a local non-profit 501c3 organization who helps needy, grieving, and hospitalized kids in Sacramento and Yolo counties. Since the Giving Tree’s inception in 2002, they have been able to help close to 9,000 children during their time of need. Our goal is to raise money and awareness—and to give you the opportunity to play a really fun round of golf. We guarantee you will have never played a round like this before. The fun starts at 9:00am with putting contests, raffles, a driving range, beverages, and breakfast burritos. The shotgun start is scheduled for 10:30am with a boxed lunch, beverages, interactive sponsor holes, course contests, and more. After the golf, the fun continues with dinner, drinks, a brief awards show, more raffles, and silent and live auctions. This party will be fun for everyone—including non-golfers. Help Us To Conquer Childhood Cancer! We are an Irish family from Dublin that immigrated to the United States. Starting on the East Coast and working our way west, we eventually decided to make Sacramento California our official home away from home in 1984. Sacramento has always been so good to our family, and we’ve always felt compelled to give something back to this great city. So we worked tirelessly to create de Vere's Irish Pub—a place where friends, families, and co-workers could come enjoy homemade food, watch American and European sports, weekend brunch, and try more whiskeys than most knew existed. We come from a family of publicans, so we know what it takes to create an authentic experience. That’s why we went back to Ireland to have all the pub fixtures and furniture designed and built. (It’s true—everything was shipped in pieces across the Atlantic and then reassembled here!) We also filled our walls with family paintings, pictures, and antiques. You can feel the heart of Ireland beating in every nook and cranny. Ultimately, we want you to experience all that Ireland has to offer, right here in California. That’s why we pride ourselves in our inventive food, friendly service, and of course, our 20-ounce pints of Guinness. Come taste the soul of Ireland, poured to perfection and curved to fit the palm your hand. Mouthwatering meals, beautiful woodwork, friendly banter (and bartenders! ), live sports, and a family-friendly setting—you’ll find it all here. So whether you’re coming in to grab a bite, meet for business, or socialize with friends, you’ll be sure to enjoy the best craic in California!